Crossing into Italy for the first time through the Mont Blanc tunnel was a thoroughly organised and efficient affair. The only uncomfortable feeling resulted from the jaw dropping cost! 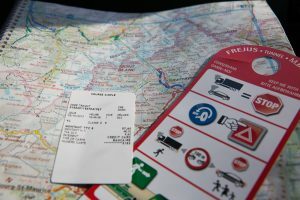 €57.60 for a camping car and that’s not even for a return ticket! Rules a plenty we were provided with a handy list to hang on our rear view mirror just in case we missed the numerous illuminated signs. In fairness the rules seemed quite sensible and made for a swift passage. RULE 0 – abide by the speed limits..they will catch you and WILL fine you! Minimum 50kph and maximum 70kph with 100m between vehicles.